It’s not often I tackle two apps in the same review. However, today’s a bit different: the apps I’m looking at, Catch and I Journal, are meant to be used together. Catch is note-capturing tool similar to Evernote, while I Journal is a journaling tool that uses Catch’s engine and tagging system in order to function. 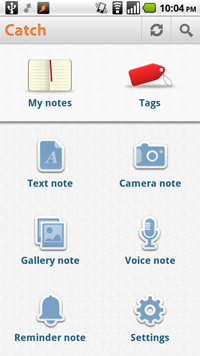 For those who have never used a cloud-based note system, Catch is definitely a great tool for organizing your thoughts. Using its system, you can store text, voice, photo and notifications to a cloud-enabled account, letting you access it from both your browser and your phone. This is obviously a big help if you’re the creative type that has ideas often and doesn’t have the memory to back it up. The main appeal of Catch is this cloud functionality; it’s a great way to easily share and store photos as well as quick notes. I have a few concerns about it being able to do any heavy lifting, but I’ll get to that later in the review. Catch’s partner in this review, I Journal, is based around concepts outlines in a book called “The Happiness Advantage.” I’m not going to shill for the book because I’ve never read it; instead, I’m going to approach the app like I would any other. 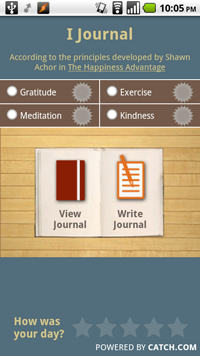 I Journal uses Catch as storage for the journal entries it makes; it automatically marks posts created through it with “#Ijournal” and other tags for easy identification. 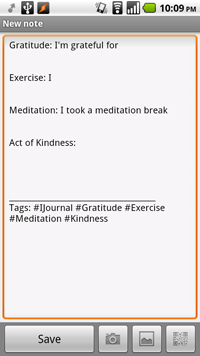 Within the creation process, users can mark whether an entry is one that relates to “Gratitude,” “Exercise,” “Meditation” or “Kindness,” which in turn will add more tags. This allows for easy sorting and reflecting, especially when coupled with a “rate your day out of five stars” query. I’ve always liked journaling; part of why I write opinion is that I like to open myself up to other people. 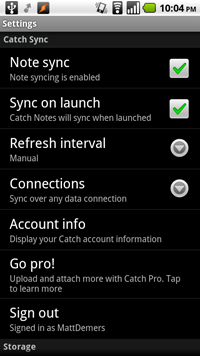 However, I’m a bit skeptical about Catch as a way to do this. Like my problems with tablets, I take issue with that fact that it’s very unwieldy to enter long-form writing on a mobile screen. I don’t like typing on my Atrix for any extended period of time: I don’t write Droid Life posts on my phone, and don’t see myself journaling with it, either. However, I could see myself using Catch like I do Evernote – for quick review and offline reading. Since syncing stores an offline copy of notes on your phone, Catch is useful when you absolutely need access to something you’ve stored there; as long as you’ve synced recently, things should be alright. 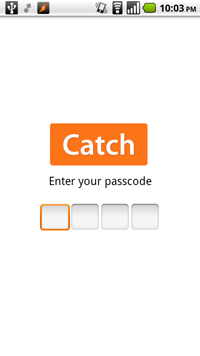 Catch and I Journal’s usefulness is really dependant on the individual user. They’re very well-implemented systems, but it’s difficult to blanket whether they’re “good” or not based on the fact that I already have apps that do the same job. I mean, I could easily use Evernote to do the exact same things as Catch: however, I Journal’s specific purpose makes it easy for people who are looking for that experience to get into it. It’s like when I reviewed ActionComplete a couple weeks ago: it’s an app specifically tailored to the Getting Things Done system. I could have easily use Astrid to do the same things that ActionComplete does, but since the latter is specifically tailored to my my needs, I’m obviously going to use it. Who knows? Maybe these apps are something you, the reader, needs. Both Catch and I Journal are free downloads. Matt Demers is Droid Life’s app guy, and kind of misses journaling. The next best thing is his Twitter and Tumblr, which are updated daily. Check them out!